The most memorable element of the past week here at Delphi has been the weather. We had little or no wind most of the week and it was incredibly warm and humid with temperatures as high as 26 degrees C. We also got some good thundery downpours which totalled to 25.4mms. The only problem with the thunder lumps is they run off very quickly. With this in mind I suppose I should tell you that the fishing was difficult to say the least, with only nine fish landed since my last update. Again there were fish coming in on every tide but there was little or no take on them at all. First off the mark this past week was Christopher Jarman with a picture perfect sea liced grilse of 6lbs9ozs off the Quarry Run on a Willie Gunn. He followed this up half an hour later with an old fish of 7lbs15ozs off the Turn pool on a Nymph. 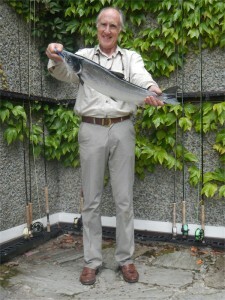 There were two on the 21st, with Bob Hadden landing a fish of approx. 3lbs8ozs in Morrisons on a Cascade mini tube. This was followed by the old maestro himself John Mills with a fish of 6lbs11ozs off Finlough on a Willie Gunn. We had two again on the 22nd, with Alexander Mills landing one of 3lbs1oz from the Turn pool on a nondescript and Christopher Jarman with a fine fish of approx. 9lbs off Finlough on a Red Francis. Christopher had his fourth of the week on the 23rd off the Turn pool on a Nymph weighing in at 9lbs14ozs. John Mills had his second of the week on the 25th on a Willie Gunn from Finlough weighing in at approx. 3lbs. Finally Anthony Walsh had one on the 26th off the Bridge pool on a Beaded Nymph weighing in at approx. 3lbs. Sea trout were relatively slow this week with only 26 landed. The highlight of this was John and Alexander Mills who had fifteen in a session off Doolough. Conditions were far from ideal for sea trout fishing.